For general GroupWise Mobile Server licensing entitlements, see Section 1.11, Licensing. 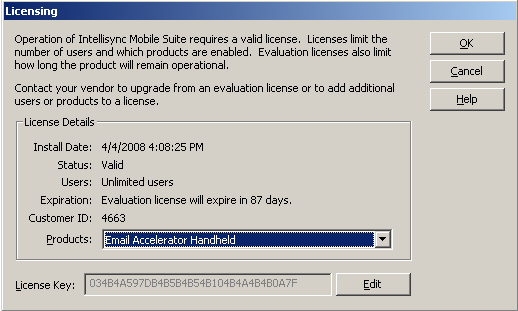 Use the Novell Customer Care Portal to upgrade an evaluation license to a permanent license. In the Intellisync Mobile Suite Admin Console, select Intellisync Mobile Suite. Click Action > About Intellisync Mobile Suite. Click Edit, then delete the evaluation license key from the License Key field. Select and copy your permanent license into the License Key field, then click Apply. Click OK to put the new license into effect.